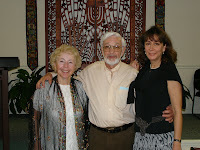 Rabbi Larry Mahrer invited me to speak after Shabbat Service on Friday, Feb. 15th. Victoria Siegel, a member of CRC in St Louis (Rabbi Susan Talve's Congregation) flew to Sarasota from St. Louis for a brief holiday. 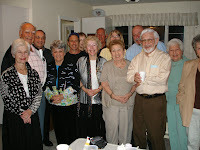 We shared a meal and drove up to Temple Beth El in Bradenton. At the conclusion of Shabbat Service, I spoke about Roman Catholic Womenpriests as an initiative of reform and renewal within the Roman Catholic Church. I shared that RCWP is reclaiming our ancient heritage that women were ordained for the first twelve hundred years of the church's history. I stressed our common bonds with the people we serve. We are all one people of God and that we are trying to transform the clerical structures and have a more open, accountable, transparent church. I cited the three branches of Judaism Reform, Conservative, Orthodox as a possible model for the church of the future. I spoke for about 15 minutes and then opened up to questions and had a dialogue around the issues that the Jewish congregation wanted to discuss. They gave me/our movement a warm welcome and conveyed that they would pray for us. Several of the couples who talked with me afterwards were Jewish-Catholic. Some talked about the prejudice of Catholics against Jews not only in the pre-Vatian 11 church, but in one case, in a text that is used by some home-school Catholic programs which reflect a negative stance toward the Jewish people as causing Jesus' wounds on the cross. I thought that brand of anti-semitism was long gone. Sad to say it is still around. I believe that RCWP has an opportunity to foster closer relationships with people from different faith traditions. Tonight I felt that an ember from the fire of the Spirit that we experienced in the St. Louis ordinations had ignited in Florida. I was deeply honored to participate in a forum of respectful dialogue with a community of believers from the Reform tradition of Judaism. It was quite a positive, energizing experience!